Seafood represents a diverse range of food that includes fish, shellfish, and sea vegetables. There are all kinds of different seafood, and they are some of the most nutrient-dense foods we can eat. Additionally, they are an important source of omega-3 fatty acids, which are essential for our overall health. This article examines 15 healthy types of seafood alongside their nutrition profile, omega-3 content, and the top five nutrients they contain. If you are looking for a healthier diet, then including some of these foods is a great way to start. Salmon is one of the most popular fish in the world, which is quite easy to understand given how delicious it tastes. Also, salmon comes in all different shapes and sizes, and there are numerous popular species of salmon (see here for a full guide to the differences). Salmon is also adaptable, and we can eat it fresh, as raw fish (sashimi) or in canned form for convenience. Nutritionally, salmon contains an impressive range of beneficial nutrients as well as some interesting bioactive compounds such as astaxanthin. Astaxanthin is a carotenoid compound, and randomized controlled trials suggest that it can help to improve our skin’s UV resistance (1). Additionally, salmon is extremely rich in essential omega-3 fatty acids. See this guide for a full overview of salmon’s benefits. Key Point: Salmon is rich in protein, omega-3 and contains high amounts of vitamin B12 and selenium. With a slimy appearance, people seem to either love or hate this type of mollusk shellfish. However, oysters are one of the healthiest seafood options. Alongside organ meats like liver, oysters are one of the most nutrient-dense foods out there. We can either eat them raw or cooked, and they provide a substantial amount of Zinc, copper, and B vitamins. Additionally, oysters are a rare food source of the essential vitamin D.
Key Point: Oysters offer an unbelievably high amount of nutrition for very little calories. Trout is a cousin of salmon, and the two fish have a similar appearance. The taste is also somewhat similar, but trout has a milder flavor than salmon, which could be a positive or a negative depending on personal preference. Both of these fish share some positive traits too; specifically, they are high in omega-3, low in mercury, and offer an excellent source of vitamins and minerals. For a tasty meal, try cooking trout in a lemon butter sauce. You can find some recipes in this full guide to rainbow trout. Key Point: Trout offers a similar nutrient profile to salmon, but with a milder taste. Similar to oysters, abalone is another shellfish that offers a significant amount of beneficial nutrients. Although abalone is relatively low in fat, it still manages to provide some omega-3 fatty acids, and it is rich in protein too. Furthermore, abalone is an excellent source of iodine, an essential trace element that many people are not consuming in sufficient amounts. Approximately 2 billion people around the world have an iodine deficiency (5, 6). Abalone has a soft and chewy texture and a creamy, salty taste. Key Point: Abalone is a nutritious type of shellfish which is especially popular in Asian cuisine. Although octopus is not so “normal” in traditional Western cuisine, it plays a significant part of various cuisines around the world. For instance, the octopus is a valued part of the diet in countries such as Japan, Korea, Singapore, and several Mediterranean countries. On the negative side, octopus is one of those foods that people tend to either love or hate. Much of this depends on how the octopus cooks since overcooking can quickly make it too chewy. To get around this, it is better to cook octopus either slowly on a low-heat or quickly but for a minimal amount of time. Key Point: Octopus may be an acquired taste, but it is very nutrient-dense. Mackerel is another oily fish that provides a great source of omega-3. However, it is worth noting that there are several different species of mackerel, and not all of them are equally healthy. Atlantic mackerel is the best bet because it contains very little mercury. However, it is better to avoid King Mackerel and Spanish Mackerel since these fish can contain high amounts of this heavy metal (9). One of the best things about mackerel is just how affordable it is. While salmon is delicious and very healthy, it can be a struggle for some families to afford. There is no such problem with mackerel as it tends to sell for about half the price (or less). In addition to omega-3, mackerel provides a decent range of vitamins and minerals too. For a full guide to mackerel, see here. Key Point: Mackerel provides exceptional amounts of omega-3 and it also provides vitamin D and a range of B vitamins. Herring is a small and nutritious oily fish that mainly lives in the Atlantic and Pacific oceans. However, there are some freshwater varieties too. Regarding taste, herring are quite strong and flavorful, and they are a little bit salty with a soft texture. Herring also has an interesting history as a traditional breakfast, particularly in the UK, but also some areas in North America. This breakfast involves eating herring in their “kippered” state. Kippers are whole herring fish which have been salted and smoked. Cooking kippers with a bit of butter is delicious, and they make a great breakfast. Key Point: Herring is a great source of protein, omega-3 and vitamin D.
Squid is otherwise known as calamari, and it is a popular food in cuisines around the world. Depending on the country, it can be prepared in a range of different ways. In the Mediterranean region, chefs tend to either fry squid or serve it as a stew which incorporates vegetables. In contrast, people eat it raw in East Asia as sashimi or sushi. Key Point: Squid provides a surprising amount of omega-3 given it is a low-fat food. It is also rich in copper and other minerals. Sardines are one of the cheapest and healthiest fish. First of all, we eat sardines in their whole form, and this includes the organs and small bones they contain. As a result, they offer exceptional nutrient-density and an excellent non-dairy source of calcium. Furthermore, sardines provide more than 100% of the daily value for vitamin D. They are also one of the most concentrated sources of omega-3 fatty acids. Depending on location, sardines may be available in their fresh or frozen form, but canned options are available around the world. For more on their benefits, see this complete guide to sardines. Key Point: Sardines are a healthy choice of fish that offer an impressive range of nutrients. In addition to fish and shellfish, there is another category of seafood that can be incredibly nutrient-dense; sea vegetables. 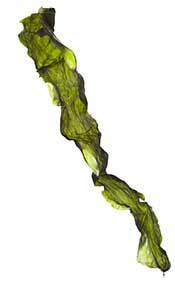 On the negative side, not many of us eat enough sea vegetables. Most people in Western nations do not eat any at all. This lack of attention is a shame given how nutritious they are, and they also contain some unique beneficial compounds. As mentioned earlier, iodine deficiency is relatively common. Sea vegetables can make a big difference here because they are the most iodine-rich foods on earth (14). There is a wide variety of different sea vegetables, but some of the most common include kelp, kombu, nori, and wakame. Key Point: Sea vegetables contain a wealth of health-promoting compounds. Shrimp belongs to the crustacea family of shellfish, and they provide an excellent source of healthy fats, protein, and various micronutrients. Shrimp also contains many nutrients that we have a suboptimal intake of, such as selenium and choline (16, 17). Despite historical fears over their cholesterol content, shrimp have been exonerated of blame over the past few years. Notably, research has clearly shown that dietary cholesterol has little effect on plasma (blood levels) of cholesterol (18, 19). See this guide to the benefits and drawbacks of shrimp for a full review. Key Point: Shrimp is a healthy and nutrient-dense seafood. Clams are another type of shellfish that offer exceptional nutritional value. Belonging to the mollusk family of shellfish, they have a salty taste and a soft, chewy texture. Typically, people either eat lightly seasoned clams on their own, but they also work well in a variety of soups and stews. 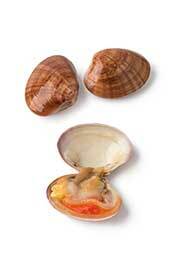 Nutritionally speaking, clams offer some excellent benefits, and they provide an exceptional source of vitamin B12. Key Point: Clams are extremely high in nutritional value. Anchovies are one of the smallest edible fish in the world, but they pack an impressive nutritional punch. As a small oily fish, they share some common traits with sardines. However, these two fish are entirely different species and belong to different families of fish. There is quite a big difference in their taste too. For instance, anchovies are notably stronger in flavor and sardines are relatively mild in comparison. 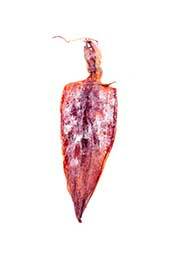 Anchovies are almost always preserved in brine or salt-cured too, which gives them a saltier taste. Due to these differences, sardines work better eaten alone, but anchovies contribute a fuller flavor when used in various dishes. Key Point: Anchovies are a small but very nutritious type of seafood. Mussels belong to the mollusk family of shellfish, and like oysters and clams, they offer a lot of benefits. Most notably, mussels are a substantial source of B vitamins and the mineral manganese. They also offer a decent amount of omega-3. Regarding taste, they are both mild and salty, with a soft and chewy texture. Like other shellfish, we can eat them alone along with various seasonings like lemon, soy sauce, garlic, and butter. Additionally, they work well in a range of cooked dishes. For example, Thai-style mussel curries are famous around the world. For anyone interested, there is a good recipe for Thai coconut mussels here. Key Point: Mussels are a nutrient-rich type of shellfish that are particularly high in vitamin B12. Interestingly, crab is very low in calories and only contains minimal amounts of fat. Despite this, crab offers a lot nutritionally, and it is a sizeable source of numerous vitamins and minerals. While crab tastes somewhat similar to white fish, it is very mild in flavor with hints of sweetness, and it has a softer texture. On the downside, one negative point about crab is that many people suffer from shellfish allergy. This allergy is not unique to crab, and it impacts fellow members of the crustacea family of shellfish including shrimp and lobster. Approximately 0.5 to 2.5% of the world’s population suffer from this potentially serious shellfish allergy (24). Key Point: Crab is low in calories, but high in protein and beneficial vitamins and minerals. As shown throughout the nutrition profiles of these foods, seafood is so much more than just omega-3. Fish, shellfish, and sea vegetables are some of the most nutrient-dense choices out of any food group. Finally, many types of seafood are reasonably priced, so they offer an excellent and affordable way to improve our overall diet.